Taking a Taxi to and From Paris Airports: Is it Worth It? Many readers ask me whether I think it's worthwhile to pay for a taxi ride to and from the airport in Paris. It's certainly not the cheapest option, but is taking a taxi to or from Paris airports ultimately the easiest and least stressful mode of transport? And how much should you expect to pay for a typical taxi fare between the city center and the airports? There's no straightforward answer to the question of whether taking a taxi is the best option. If you have a fairly generous budget, lots of heavy bags, are traveling with very young children or are elderly or disabled, I would absolutely recommend taking a taxi, which is generally a much more relaxed option with less walking or transfer time involved. Conversely, if you're trying to watch travel expenses, have packed reasonably light, and are comfortable navigating Paris' public transportation systems, taking the commuter train (RER), special bus services to central Paris or airline shuttles are a much cheaper option. How Much Can I Expect to Pay for a Taxi from Paris Airports? Depending on traffic conditions and the time of day you're traveling, you can expect to pay anywhere from 35 to 70 Euros for a single taxi ride to or from airports in Paris. Of course, if you take a taxi from Denfert-Rochereau in south Paris to the relatively nearby Orly Airport, you'll pay at the lower end of the scale. If you were to take a taxi all the way from South Paris to Roissy-Charles de Gaulle Airport well north of the city, expect a much higher rate. You may always ask the taxi for the average fare from your point of departure before accepting the ride. Remember that if you reserve a taxi in advance, you'll generally have to pay a reservation and pickup fee on top of the fare itself. At Charles de Gaulle and Orly Airports, look for signs and icons pointing to taxi pickup zones from your arrivals terminal. 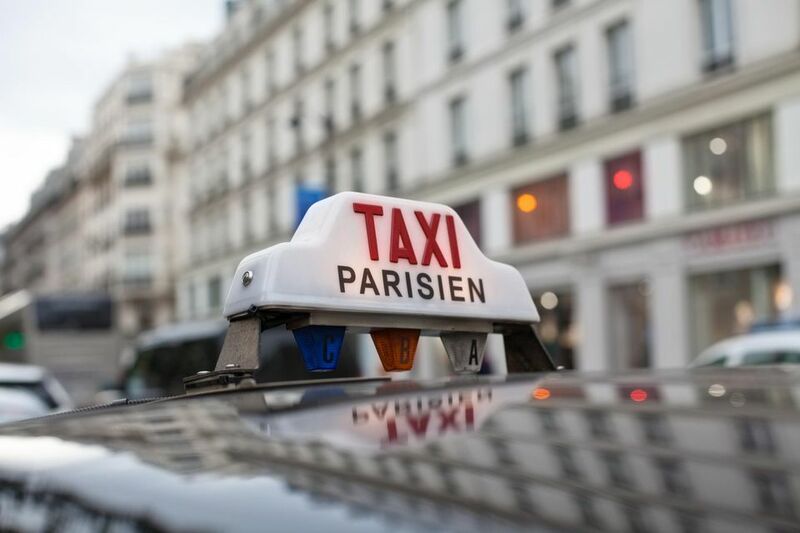 From Paris, if you don't wish to reserve a taxi ahead of time, you can find taxis in abundance around major train and transport centers such as Gare du Nord, Gare de L'Est, Gare du Montparnasse, Gare d'Austerlitz or Gare St Lazare. If you're heading to Charles de Gaulle Airport, it's best to hail a taxi from Gare du Nord or Gare de l'Est, since the overall fare will generally be cheaper from these points. If you're heading to Orly Airport south of Paris, hailing a cab from Gare Montparnasse or the Denfert-Rochereau RER station can be a good option. One safety caveat: Never accept a ride in a taxi that does not have a meter, a clearly visible sign on the roof reading "taxi" or otherwise strikes you as less than professional in appearance. This can lead to getting ripped off, and there have also been isolated incidents of kidnappings in the past by individuals posing as taxi drivers. Below are some of the most commonly used taxi companies in Paris, and all offer service to Paris airports. In some cases, online reservation is available.